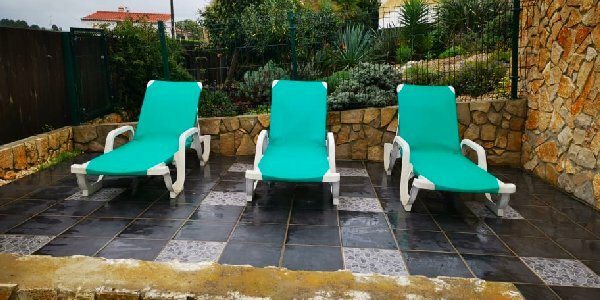 The Holiday apartment / Western Algarve (~ 55 m²) is situated in a very quiet aera of Vale da Telha / Arrifana, 4 km from the beaches of Arrifana and M. Clérigo. Restaurants and supermarket are close. 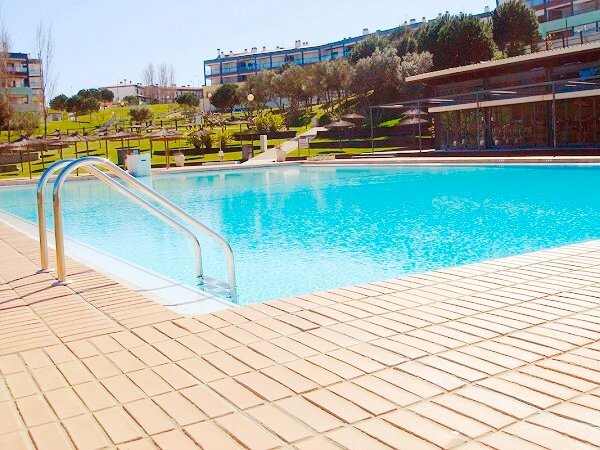 The nearby hotel pool can be used by guests of holiday apartment, by paying an entrance fee. The holiday apartment has 1 bedroom (1 double bed), 1 living-room with sofa bed (2 single beds) and satellite TV, WIFI, kitchen (micro wave, toaster, coffee machine, kettle, ceramic plate, electric hot air oven), bathroom (shower), 1 air conditioner. The holiday apartment has a roof terrace with sea view and a ground terrace with private garden of about 75 m². The rental prices of the holiday apartment are valid for two persons and a minimum stay of 7 nights. For final cleaning there is an extra charge from 25,00 €. Outsite high season longterm lent for 450 €/ month from 3 month on. Bedding and towels are supplied. The use of the air conditioners is not included in the rental price and is charged with the electricity consume. Vale da Telha / Arrifana with sea view from the roof terrace. 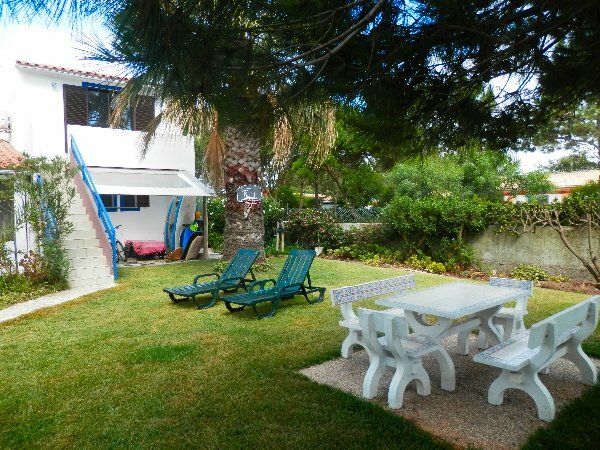 4 km from the beaches of Arrifana and Monte Clérigo, 6 km from the town of Aljezur. Shops and restaurants are within walking distance in 2 minutes. The pool at the hotel just a few meters distance can be used by guests of holiday apartment, by paying an entrance fee. The holiday apartments consists of: 1 living room with sofa bed + satellite and Portuguese TV, air conditioning) / Fully equipped kitchen, coffee maker, toaster, microwave and kettle available, 1 bathroom (shower), 2 bedrooms (2 doublebeds), 1 terrace with table, chairs , 2 sun loungers and parasol, 1 balcony (portable grill). Wilan. On request a cot is provided. The prices are valid for 4 persons and a minimum stay of 7 nights. For final cleaning there is an extra charge from 35 €. Refundable security deposit: 100,- € Bedding and towels are supplied. Outsite high season longterm lent for 450 €/ month from 3 month on. The rental prices are valid for 4 persons. Minimum stay 3 nights. 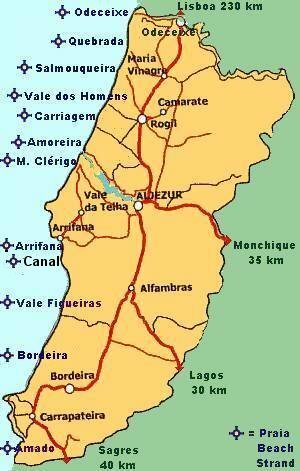 The apartment (60 sqm) is located in the historic town of Aljezur, central to shops, cafes and restaurants. Located on the first floor in the 2 floor main building in a style typical of the nine tens century. It has its own terrace with portable grill and a spacious outdoor seating area and a own entrance from the street that leads to the castle of Aljezur. Yard is exclusively used by tenants of the apartment 2. The apartment has a big living and dining area, a kitchen (washing machine) and a outside bathroom (shower) and 2 bedrooms ( double beds). 01.05. - 30.06. + 01.09. - 31.10. 01.07. - 30.08. 01.11. - 30.04. Endcleaning 50 € / Special rates for longer stays from Oct. on. / Utensils, towels and bedding are adequately available. 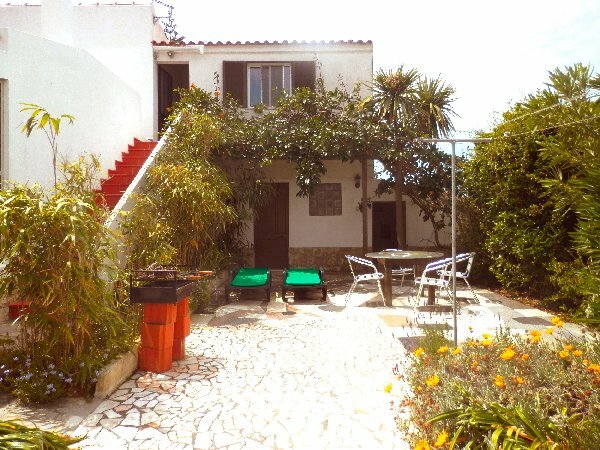 The apartment (40 sqm) is located in the historic town of Aljezur, central to shops, cafes and restaurants. Located on the ground floor of the 2 floor main building in a style typical of the nine tens century. It has its own garden, BBQ room, a spacious outdoor seating area and a own entrance from the outside in the courtyard. Yard and garden are exclusively used by tenants of the apartment. The apartment has a shower room a kitchenette and sleeping area. Endcleaning 40 € / Special rates for longer stays from Oct. on. / Laundry can be washed for 5 euros per load. / Utensils, towels and bedding are adequately available. The 3 -star resort Marina Park is situated at Meia Praia behind the marina of Lagos with views from behind over inner land and at the front over Lagos and the sea, surrounded by a large, fenced park, through which flows a stream which terminates in a small lake. The resort has a large pool area with a restaurant / snack bar. Tennis courts, children's playground. The entry of the resort is monitored 24 hours. There is a supermarket at the front of the condominium. Fully equipped kitchen area: 4 burner hob with oven (electric), microwave, washing machine, fridge with ice compartment. Living area: TV, dining area , sofa bed (2 twin beds), air conditioning. Large terrace, equiped, retractable sunshade (manual). Direct sea views from the living, - kitchen area and the large terrace. Access to the apartment with elevator or stairs. Suitable for disabled. The prices are valid for 2 persons and a minimum stay of 7 nights. For final cleaning there is an extra charge from 50,00 € Bedding and towels are supplied. The use of air conditioner is included in the rental price up to a maximum of 2 € of electricity per day, which by normal use is enought, everything more it is counted extra with normal price of electricity.